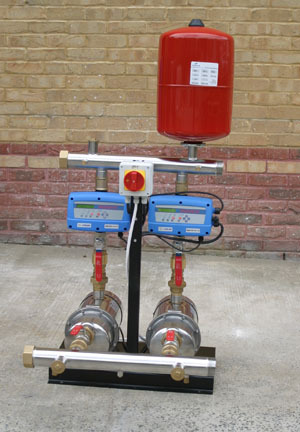 3P BVM series pressure booster sets are designed to supply water under pressure to multiple points of use. Variable Speed Pressure Control maintains a near constant pressure by regulating the motor speed of each pump, providing considerable gains in efficiency compared to basic fixed speed pressure control. Pressure is measured at the outlet manifold by an electronic pressure sensor with greater reliability than mechanical switches. Features include adjustable pressure, duty standby/assist with alternation at each pump cycle, and BMS output, whilst remaining extremely compact. An optional float switch can be situated in a break tank or well providing an adjustable safety shut-off to prevent dry running.